Helps maintain a healthy gut and promotes normal stools for your pet. VBS Clay is a geological nanomaterial that adsorbs bacterial enterotoxins and increases the reabsorption of intra-luminal water in the gastrointestinal tract, resulting in normalization of the stools. 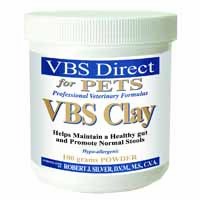 There are currently no questions for VBS Clay Powder - be the first to ask one!